Benjamin L. Cardin is a Democratic member of the United States Senate, representing Maryland. He was elected to his position in 2006. Prior to his career in the Senate, Cardin was a representative in the House since 1987, representing Maryland's 3rd District. Cardin served in the Maryland House of Delegates from 1967-1986 and he was Speaker from 1979-1986. He graduated from the University of Maryland School of Law in 1967, the first in his class. He earned his Bachelor's of Arts degree in 1964 from the University of Pittsburgh. Cardin is married to Myrna Edelman Cardin. Cardin served as chairman of the Maryland Legal Services Corp. from 1988-1995. From 1988-1999, he served on the St. Mary's College Board of Trustees, and in 2002 he was appointed to St. Mary's Advisory Board, Center for Study of Democracy. He has been a Trustee of the Baltimore Council on Foreign Affairs since 1999, and in 2003 joined the Johns Hopkins University's Institute for Policy Studies' National Advisory Board. He served on the Goucher College Board of Trustees from 1999 to 2008. In 1991, he was appointed to the University of Maryland School of Law Board of Visitors, and in 1998, he was appointed to the UMBC President's Board of Visitors. In 2007, he was appointed to the U.S. Naval Academy's Board of Visitors. Members of Baltimore Pledge of Resistance went to the district office of Rep. Ben Cardin (D-Md.) June 17 2005, to demand that he speak out against the Iraq war. The group met for several hours with Cardin’s chief administrative aide Chris Lynch. Cindy Farquhar told Lynch she was “disappointed” that Cardin did not sign on to the Woolsey Amendment, named for Rep. Lynn Woolsey (D-Calif.) requiring President George W. Bush to announce an “exit strategy” to bring U.S. troops home from Iraq. Maria Allwine, a Green Party candidate for the U.S. Senate replied, “It asks Bush to answer the Downing Street Memo’s allegation that he ‘fixed’ intelligence on Iraq. Mr. Bush doesn’t feel he needs to answer it.” Rep. John Conyers (D-Mich.) is the leading Democrat on the House Judiciary committee. If Cardin “can’t even put his signature on a letter demanding that Bush answer those questions, I can see that Cardin doesn’t represent me,” Allwine said. As the meeting proceeded, other POR members began reading aloud and attaching to a mock “memorial wall” the names of the 1,700 U.S. soldiers and thousands of coalition troops and Iraqis who have died. “Presente,” they said after each name. When 5:30 p.m. arrived, another Cardin aide announced that the office was closing. Those who refused to leave would face arrest, she warned. Many departed but Farquhar, Allwine, Baltimore Veterans for Peace leader Ellen Barfield, and peace activist, Max Obuszewski made clear they would not leave until they heard from Cardin. Finally, Lynch telephoned Cardin. The aide returned about 7 p.m. to tell the POR delegation that the Congressman had agreed to three of the four proposals: He would sign on to Conyers letter, endorse Rep. Nancy Pelosi’s (D-Calif.) “timetable” for withdrawal from Iraq; and would call for the closing of the U.S. Detention Center at Guantanamo Bay, Cuba. Cardin conveyed that he wants to meet with the delegation on the fourth proposal: voting against future funding of the war. The Council for a Livable World, founded in 1962 by long-time socialist activist and alleged Soviet agent, Leo Szilard, is a non-profit advocacy organization that seeks to "reduce the danger of nuclear weapons and increase national security", primarily through supporting progressive, congressional candidates who support their policies. The Council supported Benjamin L. Cardin in his successful Senate run as candidate for Maryland. Senator Cardin discussed what he termed “big picture” concerns. He stated we need to conceive of national security spending as including much more than the military budget, such as investments in international development and diplomacy. However the budgets for development and diplomacy don’t reflect their essential importance to national security. He argued that the US must exhibit stronger leadership in these areas. Senator Cardin also lamented the situation in Syria and Russia’s role in aiding Assad. He noted that while he believes Assad must resign, there is no guarantee that his replacement will be better. At the 2011 Netroots Nation conference the LIUNA sponsored a Fight Back for Good Jobs rally featuring LIUNA President Terry O’Sullivan, Van Jones, Sen. Ben Cardin, Rep. Keith Ellison, Rep. Tim Walz, Minneapolis Mayor R. T. Rybak, St. Paul Mayor Chris Coleman and other political, business and community leaders. Maryland seniors hear from MD Secretary on Aging Gloria Lawlah & U.S. 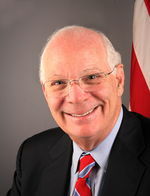 Senator Cardin (D-MD), August, 2011. U.S. Senator Ben Cardin (D-MD) addressed the Maryland/DC Alliance for Retired Americans, August 4, 2011 about the recently enacted budget compromise that raised the debt ceiling and saved the nation from default. The Senator assured the group that the budget agreement has protections for Social Security, Medicare & Medicaid and federal retiree benefits. Alliance for Retired Americans endorsed Ben Cardin in 2012. U.S. Senator Ben Cardin (D-MD) met May 20, 2013 with community leaders from across Prince George’s and Montgomery counties in Maryland for a roundtable on immigration reform. Hosted by CASA de Maryland, the roundtable discussion provided an opportunity for Senator Cardin to hear from key stakeholders in the immigration debate and to share the latest proposals coming from Washington. The event follows the first week of deliberation by the Senate Judiciary Committee of comprehensive immigration reform legislation (S. 744). It also comes just days after a group in the House of Representatives announced that they had reached a bipartisan agreement on immigration reform. “We need to seize this unprecedented opportunity to pass real, bipartisan immigration reform. We cannot do this in pieces; it must be a comprehensive effort that allows for a fair pathway to citizenship for the approximately 11 million undocumented immigrants now living in the United States. Local union activist Jaime Contreras agrees. "Comprehensive immigration reform is possible this year. The political landscape has changed, and I think our friends on the right have now figured out that this is a good time for them to change their face with the immigrant community." Cardin hosted a Roundtable with Latino Small Business Owners in Prince George’s County, Monday, September 22, 2014. Zorayda Moreira-Smith- Senior Manager of Place-Based Solutions & Community Development of CASA de Maryland. Jolene Ivey held the position of Press Secretary for U.S. Representative Benjamin L. Cardin of Maryland, 1988-89. Del. Ivey is currently in the Board of Directors of CASA de Maryland. 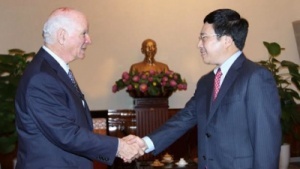 Vietnamese Deputy Prime Minister and Foreign Minister Pham Binh Minh welcomed US Senator Ben Cardin to Viet Nam May 2014, calling it an opportunity to frankly and openly discuss issues of common concern. Minh said this is a time to strengthen bilateral ties and urging the US Congress to support the exchange of delegations at all levels, continue opening the US market for Vietnamese goods while reducing trade barriers. He also voiced his hope for a decrease of cases of anti-dumping and anti-subsidy, as well as flexibility in the Trans-Pacific Partnership (TPP) talks as pledged by the US. Mr. Cardin, who is also the chair of the East Asian and Pacific Affairs Subcommittee of the Senate Foreign Relations Committee, voiced his support for the two countries in implementing the comprehensive partnership and for early conclusion of TPP talks. The two sides exchanged views on regional and international issues, including the current situation in the East Sea. Ben Cardin: Cuba’s Removal Gives The US “The Space Needed To More Vigorously Promote Our National Interests And The Values That We As A Nation Hold Dear.” “Following the Cuban government’s release of Marylander Alan Gross late last year, the United States has a unique opportunity to begin a fresh chapter with Cuba. This announcement clears the way for the United States and Cuba to re-establish diplomatic relations and strengthen people-to-people ties between our two countries. The Obama Administration now has the space needed to more vigorously promote our national interests and the values that we as a nation hold dear. A healthy and prosperous Cuba will promote a more open society and that is good for the United States.” Cardin Press Release, “Cardin Statement on the President’s Decision to Remove Cuba from the List of State Sponsors of Terrorism,” 4/14/15. Three visiting U.S. senators said on June 27, 2015, they hoped Congress would support President Barack Obama's opening toward Cuba, including lifting a ban on U.S. citizens traveling to the Communist-run island. 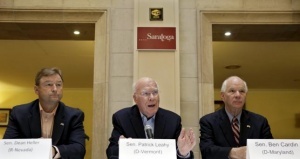 Democratic Senators Patrick Leahy of Vermont and Ben Cardin of Maryland joined Republican Dean Heller of Nevada on a trip to Cuba where they met First Vice-President Miguel Diaz-Canel, Foreign Minister Bruno Rodriguez and ordinary Cubans. "We think that can be achieved this year and we can make additional progress next year," Cardin told a news conference. "We're optimistic this path that President Obama and President (Raul) Castro started will be continued." Heller, one of a few Republican senators to side with Obama on Cuba, encouraged members of Congress to visit Cuba and engage with ordinary Cubans. "I think the Senate can move the House, but the Senate's going to have to act first," Heller told Reuters after the news conference. “I particularly want to commend CAIR for working to educate others about Islam, a religion of more than one billion people in the world. CAIR also has provided members of the Muslim community in the United States with an important voice in promoting social justice and mutual understanding. CAIR has 31 offices nationwide and in Canada and through your work you have helped promote a dialogue among employers, law enforcement officials, and government agencies. CAIR understands the importance of developing mutual understanding and trust.”- Sen. Benjamin L. Cardin (D-Md.) (November 2007). This page was last modified on 22 January 2018, at 23:17.